LinkedIn’s new CardMunch app, which scans a screenshot of a card and records all the information into your phone, works — it just takes a good 12 hours before you’ll get the information. That’s how long it took us to receive the info from cards we uploaded through the application. We uploaded our cards as soon as the app came out at around noon yesterday and we didn’t see a response until we were inspecting the Occupy Wall Street protests at around 11 p.m.
All the correct information for the cards still came in — along with a screenshot of the card above each card profile. You can connect with people on LinkedIn straight from their card profile, too. CardMunch uses Mechanical Turk, an Amazon service that exports menial tasks (like reading cards) to individuals across the Internet. Mechanical Turk sends the image of the card over to an actual person that transcribes it and sends the information back to CardMunch. 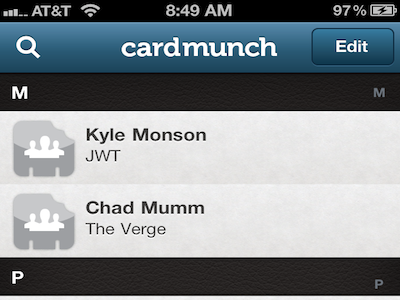 The app just came out yesterday, so there was probably a large backlog of cards going into CardMunch’s system. In the future it might not take quite as long to process a card.